In large residential buildings containing multiple units, a communal solar heating system is often a more appropriate solution than individual systems supplying each apartment. We offer communal solar thermal systems that can be used to heat centralised solar calorifiers or cylinders in individual units. The solution we recommend will depend on the specification of the traditional domestic hot water system, the design of the building and the needs of the end user. Below is a description of the components, operation and installation etc. of a typical communal domestic LaZer2 solar hot water system for use in an apartment block. A southerly-facing pitched roof, flat roof or even wall are ideal locations on which to mount solar collectors. Collectors can be installed facing the east or west but the total collector area will need to be increased to compensate for the lower energy levels. 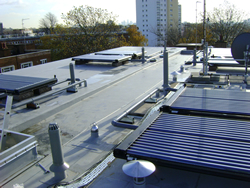 If mounted on a flat roof the collectors will ideally be tilted to 30° to maximise energy gain. The LaZer2 solar collectors can be laid flat on the roof if required, but will deliver about 10% less energy. Shading, aesthetics, roof condition and accessibility will all be considered when selecting a position for the solar collectors. Pipe work will need to be run from the collector arrays to the solar calorifiers or cylinders. Copper pipe work is typically used but stainless steel is an alternative. The high operating temperatures of the system mean that plastic pipe work is not suitable. The size of the pipe work installed will depend on the total collector area and length of pipe run. The pipe work can be run externally or internally. All pipe work will be insulated, and - if required - mechanically protected. As an anti-freeze is used in all systems no trace heating will be required. Hot water calorifiers or cylinders are always required to store the solar energy the LaZer2 system is producing. The specification of the proposed (or existing) hot water system will influence the way in which the LaZer2 system is integrated and the type of calorifier or cylinders installed. The capacity of the hot water storage will be matched to the area of collectors specified as well as the hot water demand and usage pattern. If a centralised hot water system supplies the apartments we would usually install a solar calorifier to pre-feed the main hot water calorifiers, or a calorifier that can be heated by both the solar collectors and the LTHW system or immersion heaters. The solution proposed will depend on control philosophy and plant room space etc. All solutions will incorporate controls to avoid the risk of Legionella. If each apartment has its own hot water system we would usually recommend installing cylinders that can be heated by the solar collectors and a boiler/immersion heater. The cylinders would be connected to a solar ring-main and controls would be fitted so that each cylinder can call for heat independently. In a centralised system the Lazer2 solar control system (differential controller and circulation module) will usually be installed close to the solar calorifier. In a solar ring-main system a master control system will usually be mounted close to the collectors, with individual controls (motorised valve and differential controller) in each apartment. The control settings will be optimised at the time of installation, after which no user interaction should be required. The LaZer2 system operates automatically, but the readings on controller display and gauges should be monitored regularly to ensure that the system is functioning correctly. The LaZer2 control system is totally separate to the controls for the other heat sources. The LaZer2 system functions automatically without user input. The control system monitors the collector and calorifier/cylinder temperatures and starts the pump when there is useful solar energy to be gained. When there is no more useful solar energy available the controller stops the circulating pump. The safety features incorporated into every system will ensure that the system temperatures can never get too high and that all components are protected against freezing. The key to installing the correct solar thermal system is to ensure that the client’s requirements are fully understood and that consideration is made for other systems and controls. We work with all parties to ensure that the proposed solution is the most suitable for the application. We offer a full design and specification service and can provide a fixed cost quote for any solution, with reference to any third party works required. We can supply and install the entire system; just install key parts, test and commission; or supply complete kits for installation by others. To minimise costs and ease programming we will work with contractors to assess which parts of an installation can be completed by others. Lead times for installation vary depending on the size of the system. We typically book engineers from 4 to 12 weeks in advance. We stand by our solutions and are therefore always happy to deal with any questions or queries you or the client may have. Every system we install is covered by a 2-year parts and labour warranty. The solar collectors are covered by a 25-year warranty against loss of vacuum. There is no scheduled maintenance required for the first 5-years of a system’s operating life. After 5 years we recommend that the heat transfer solution is checked and, if necessary, replaced. We recommend that systems are visually checked 3 months after commissioning, 12 months after commissioning and then annually. We offer inspection and maintenance contracts if required.